Sep 16, 2010 in "Disney's Art of Animation Resort"
Disney have launched a new webpage for their latest resort - Disney's Art of Animation. Announced back in May 2010, the new resort opens in the summer of 2012 on the area previously designated for the second phase of Disney's Pop Century Resort. The new resort will feature theming from 4 animated films - The Little Mermaid, The Lion King, Cars and Finding Nemo. Most notable will be the inclusion of 1120 family suites. Each featuring 2 separate bathrooms, a master bedroom, and 3 separate sleeping areas within the living space, which includes an "Inovabed"—an impressive piece of furniture that transforms from a generously sized dining or work table to a comfortable bed in seconds. 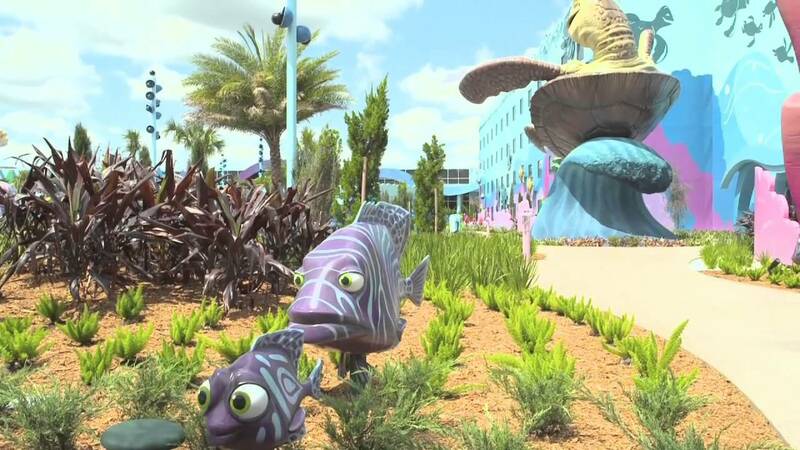 A new piece of concept art (shown below) reveals a look at the Finding Nemo water play area and buildings. You can read more about the new resort here.